The name, All Warringah Locksmiths is synonymous with reliable emergency locksmith services in Sydney. We provide comprehensive always-ready lockout service for homes and businesses in Northern Beaches. If you are a resident of Dee Why, Collaroy, Beacon Hill or Manly, locksmith solutions are just a call away. For dedicated round-the-clock locksmith services in Sydney, look no further than All Warringah. It does not matter in which part of Northern Beaches you are in, we can reach you anytime you call us. You can always rely on us, as we care about the security of your homes and business places. As soon as you report a lock emergency to us, we will be at your location. Our locksmith Sydney services continues to help countless homes and business owners across Northern Beaches. It is the commitment of All Warringah Locksmiths to improve the security of your property and assets. We can guarantee solutions for each and every lock issue. Our Manly and Beacon Hill locksmith professionals will protect your home, garage and office. With our convenient around-the-clock service replacing lost keys is just minutes away. Need a new key cut? Our re-keying service can cut a variety of different keys. Security is important and from our experience we can repair or replace all types of locks. Get expert advice on a variety of safe services including access control systems. For commercial and domestic purpose our high security keys and locks can keep your property safe. Using the latest technology our brand new electronic touch locks are a convenient and secure option. Protecting your business assets is critical and with decades of experience in commercial locksmithing services you need someone you can trust. Wherever possible we recycle the metals that keys and locks are made from. In time these metals may become scarce resources, so we are starting to recycle the important security metals, Brass and Copper, now. We have plans to start recycling Carbon Steel, Stainless Steel, Aluminium shortly. Whether you have been locked out of your home, or a lock is giving you trouble, our emergency services will cover your needs. For homes and businesses in Bayview locksmith, Narrabeen and Dee Why locksmith professionals are just a call away. We treat all emergencies with equal priority, as every minute your locks are not working can prove fatal. Our professionals are dedicated to provide full customer satisfaction at all times. We resolve lock emergencies fast, at any hour of the day. From instant repairs to sales and installations of locks and lock parts, our Bayview, Dee Why and Collaroy locksmiths will be at your assistance. We believe every lock problem should be regarded as a possible emergency. Your search for comprehensive locksmith services ends with us. If you have been seeking emergency services from locksmiths in Narrabeen, Bayview or other Northern Beach areas, we can help you out. We have been at the forefront of innovative lock related solutions for the past two decades. Our experience has made us understand the importance of properly working locks. All Warringah Locksmith professionals are equipped with cutting-edge tools and technologies. Our Dee Why and Manly locksmith professionals can detect and verify problems fast. We perform the appropriate repair work with precision. Our locksmith services include re-keying, lock repairs and key changes. We are certified professionals, with the skill and experience to solve all issues. Our experts offer installation of entrance locks, deadlocks, deadbolts, replacement locks, screen door locks, commercial door bolts, residential door bolts, garage door bolts and garage door locks. Since we are based in Dee Why, our locksmith service is well in reach of all areas within Northern Beaches. For an emergency lock repair or installation, our Collaroy, Beacon Hill and Bayview locksmith professionals can assist you. We can recommend the best locks and locking systems to ensure foolproof protection. It is our objective to provide complete solutions to secure homes and business properties. With the help of our Dee Why, Collaroy and Beacon Hill locksmith professionals, we help thousands of residents and professionals. 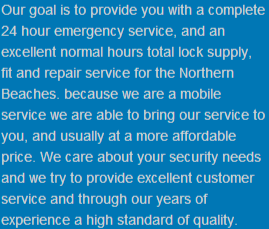 Apart from 24 hour emergency service, we provide excellent normal hours total lock supply, fit and repair service for the Northern Beaches. We maintain a high-standard of quality in all our services. Our talented locksmith professionals have worked consistently over the years, to gain the trust of Northern Beaches home and business owners. We have fulfilled the need for reliable solutions for locksmiths in Collaroy, Manly, and every single part of Northern Beaches. Our growing list of clients rely on us for all their security needs. Locksmith Sydney services throughout Northern Beaches. We are a proud member of the Locksmiths Guild of Australia. Our Dee Why locksmith professionals provide flawless and affordable locksmith services. State of the art tools and techniques to detect and resolve lock issues. Fast and hassle-free lock repair, lock installation and lock parts replacements. We take care of everything, ranging from the security of your homes, garages, safes, cars, screen doors and boats. Whether you are in Collaroy, Manly, Newport or Narrabeen locksmiths can assist you whenever you need help. Our commitment to excellence is reflected in our services. Master locksmith, Kevin Hardy, has been servicing the Northern Beaches for many years. Kevin provides a wide array of locksmith services to domestic and commercial customers. Kevin is renowned for his can-do attitude and offering an on-time and no-fuss experience. That’s why many of Kevin’s customers have relied on Kevin time after time for all their lock and key issues. Being a member of the Locksmith Guild of Australia, Kevin stays up to date providing his customers with the latest technology including new ultra strong locks and touch lock solutions. To keep your assets safe you know you can trust that All Warringah Locksmiths will have you covered.